The lack of soil maps in Brittany in the north west of France, leads to an approach based on the inference of soilscape units which can be delimited and characterised with relatively fewer field observations than conventional survey. Whereas geology and landform are generally used data to map soilscape units, natural and agricultural landscapes indicate relevant information on soils within them. 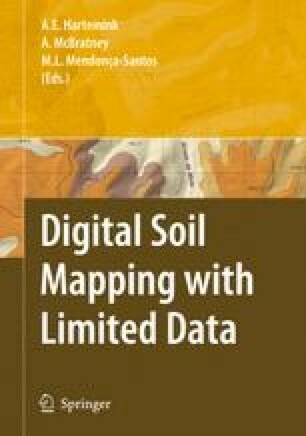 Remote sensing is obviously the main source of data to map landscape units at regional scale, but one must look carefully how to analyse landscape units, including soil properties, without simply focusing on land-use class. The proposed method for landscape classification is based on a specific classification system developed at regional and local scales, including the role of landscape patterns using object-oriented classification. Post-classification processing is then developed to generalise the results and define mixed landscapes. Finally fusion techniques are tested to examine the probability of common soilscape boundaries arising from different environmental factors (geology, elevation, landscape).